A compilation of high-definition remakes of the first three Crash Bandicoot games. 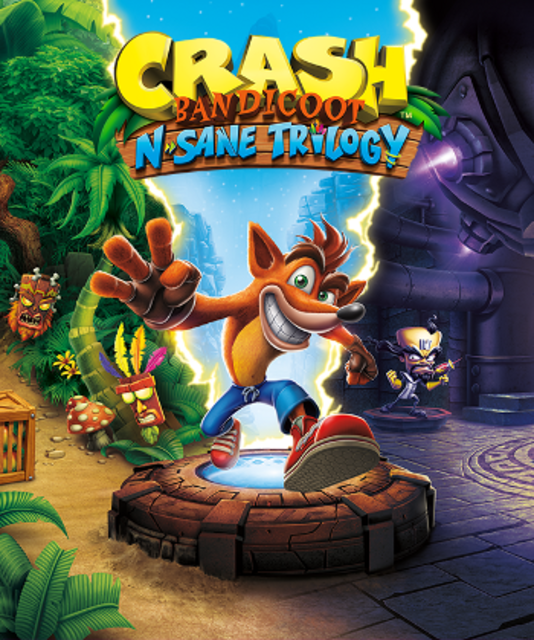 The PlayStation 4 version offers two pieces of DLC, each consisting of an extra level: "Stormy Ascent", a level which was cut from the initial PlayStation 1 release of the first Crash Bandicoot game, and "Future Tense", an original creation from the studio responsible for remastering the original PS1 games into the N. Sane Trilogy collection. Stormy Ascent was initially free, then sold for $3, and is now free once again. Future Tense has been free since its release. Both of these levels are included by default in the Xbox One, Switch, and PC releases. The PlayStation 4 version offers two pieces of DLC, each consisting of an extra level: "Stormy Ascent", a level which was cut from the initial PlayStation 1 release of the first Crash Bandicoot game, and "Future Tense", an original creation from the studio responsible for remastering the original PS1 games into the N. Sane Trilogy collection. Stormy Ascent was initially free, then sold for $3, and is now free once again. Future Tense has been free since its release. Both of these levels are included by default in the Xbox One, Switch, and PC releases.